Looking for a genuinely dog friendly holiday cottage in Norfolk? So, if you're looking for a dog friendly holiday cottage in Norfolk that... doesn't charge for your dog/dogs (and very flexible policy on dog numbers!!) that is...clean and well equipped... Where dog friendly doesn't mean dog eared! ...with enclosed outside area for your dog, where your dog can run safely...you've come to the right place! Bring your Pack on their Holidays. There are plenty of things to do and places to go in Norfolk - all over the Broads and the North Norfolk Coast. Spend your time on the coast at Cromer, a boat trip for seal watching, at the internationally famous East Ruston Old Vicarage gardens, the wonderful Bewilderwood and many other places. To help you plan your holiday in Norfolk, each dog friendly holiday cottage has a selection of leaflets about things to do and places to go in Norfolk, dog friendly walks, maps, walking books etc. 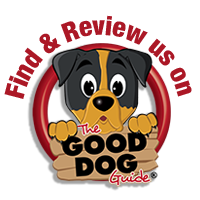 See all of our Properly Dog Friendly Holiday Properties below. Some Easter availability left to book. Filling up fast for 2019 AND taking bookings for 2020! BOOK 3 NIGHTS, GET 4th FREE! Wind in the Willows is a purpose built, beautifully styled Shepherd’s Hut. Get back to nature in the fully enclosed garden and country walks from the door. Patikipa is a peaceful and simple, traditional riverside cabin right on the bank of the river at Potter Heigham on the Norfolk Broads. Boat for hire too! Single storey conversion, easy access for mobility impaired guests. Finished to a very high standard. Off road parking, access ramp. Superking bed or twins + Sofabed. This colourful, spacious single storey annexe, is imaginatively furnished, with a double bedroom and an elegant single day bed in the conservatory. Walks onto the Weavers Way. Tasteful barn conversion with beamed, vaulted ceilings and wood burning stove. Bedroom is in the eaves with a sofabed available downstairs. Very quiet lane location in the countryside. NEW AND FILLING UP FAST! Single storey holiday cottage in Norfolk, sleeping 4 in 2 bedrooms, surrounded by countryside with miles of walks from the doorstep and great views across the fields. Modern, comfortable & very dog friendly holiday cottage in Norfolk, open plan living space, underfloor heating and VERY secure garden. Double and twin rooms. This gorgeous and very popular character holiday cottage in Norfolk has the famously dog friendly Winterton Dunes literally at the back door step. Enjoy miles of walks on the sandy beach and dunes! Charming and VERY well equipped open plan barn conversion mostly on one level. At the end of a private drive, short walk to the village dog friendly pub and shop. Double and twin or superking bedrooms. Character holiday cottage in Lessingham, Norfolk with a lovely secure garden, located at the start of a footpath walk through farm land with your dogs to the Lessingham Star pub! Peaceful and easy house on a dead end lane. Walks from the door straight onto the Weavers Way footpath, Norfolk. Large, enclosed garden with parking inside. Double and twin/double room with extra sleeping space upstairs. Stylish and charming open plan barn conversion on one level, on a designated Quiet Lane and just off the Paston Way. Brick and flint, dog friendly country cottage annexe, 1 mile from the Norfolk coast. Wonderfully stylish and comfortable holiday cottage. Two double bedrooms. Beautifully converted, well furnished single storey barn conversion. Quiet rural location with easy walks from the door. Countryside views. 1 double bedroom & 1 twin/double room. WALK TO BEACH AND PUB! Stylish, comfortable, quiet holiday cottage close to dog friendly pub and a lovely stroll to the dog friendly, sandy beach and plenty of easy countryside walks. Two double rooms and one single. Very popular house with a gorgeous interior. Short walks to sandy beach, local dog friendly pub and iconic lighthouse. Fully enclosed secure garden. Two double rooms and one single. Very stylish barn conversion, perfect for a large family of 6, or two smaller families to go away together. Short drive to the local, dog friendly Norfolk beaches. Very popular and beautifully furnished house in the heart of the quiet village, a short walk to sandy beach, local dog friendly pub/lighthouse. Large, secure garden and off road parking. Two doubles and one twin. The cosiness of a cottage but big enough to comfortably sleep 6/7. Very nicely furnished. Lovely enclosed garden. Peaceful location, ideal for country walks to the dog friendly local and just 1 mile to the beach. Three double rooms + one single. Spacious and rambling detached family home in a beautiful and peaceful location with superb views across Hickling Broad, Norfolk. Huge enclosed garden - all grass! Two dog friendly pubs within walking distance. 4 double/twin bedrooms, 3 of which are downstairs. This beautiful Arts and Crafts house is in a peaceful edge of the village location. Has its own grounds - a huge secure garden with parking. Short walk to the sandy beach, dog friendly pub and into the village. 5 double/twin bedrooms, one on the ground floor with ensuite wetroom. SO CLOSE YOU CAN HEAR THE SEA! Well appointed family house, a very short walk from the sandy Blue Flag beach in this popular village! Dog friendly beach year round. Cafe, pub and shop. Secure garden. Sleeps 10 - 12 in 5 double and twin bedrooms.